Want to know how to get these cool-looking Sonic the Hedgehog statuettes celebrating the Blue Blur's 20th birthday? Yeah, so do we. If you're the world's biggest Sonic the Hedgehog fan, then you've probably already seen Sega's Sonic the Hedgehog 20th Anniversary Figurine over on the publisher's blog. 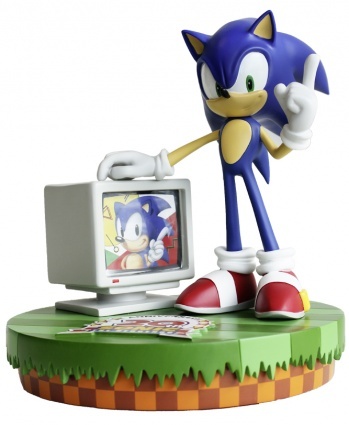 It's a pretty nifty little statuette that hearkens back to the hedgehog's origins: The current Sonic is standing on a "Green Hill Zone" base, with classic Sonic doing his trademark finger-wag in a nearby monitor. A particularly cool touch is that there are two different versions of the figurine, since "classic Sonic" looked slightly different in the US versions of the game than he did everywhere else. As far as I can tell, the only differences are that the US Sonic is a bit darker and has a more colorful background, but then again that could just be the lighting. Here's the catch, though: There are only a thousand of these figures being made, and Sega isn't telling us how you'll be able to get them. All we know is that they won't be sold in stores anywhere - they may be giveaways or part of a random-draw sweepstakes, or prizes in a contest, or anything else that we haven't thought of yet. Of course, if you're the world's biggest Sonic fan, then you probably won't think much of dropping a couple hundo on one of these babies when they inevitably show up on eBay. And if you're the world's biggest Sonic fan, then you have my sincere condolences for the past, oh, decade or so.